WRAPT gift boutique at JCPenney Manhattan Mall. During the WRAPT holiday preview last week, I got a chance to speak with Dylan Lauren and ask her a few questions about Dylan's Candy Bar and her partnership with JCPenney's new in-store gift boutique, WRAPT. 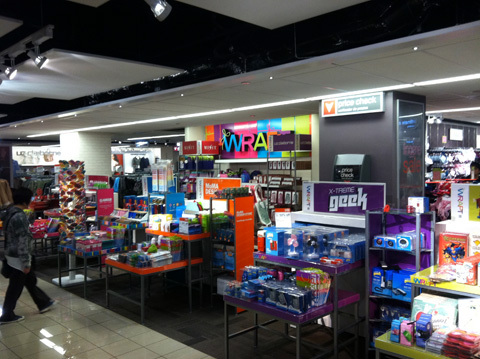 Featuring six different brands, WRAPT is now open in JCPenney Manhattan Mall and will launch in other JCP's throughout the country on October 21st. 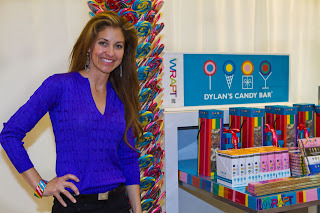 Dylan Lauren of Dylan's Candy Bar at the JCPenney WRAPT holiday preview. Me: How did this relationship with JCPenney evolve? DL: We started wholesaling with a lot of different department stores, and this WRAPT idea came up, and I think it's just a hipper concept for the JCPenney customer. If you look at the other brands, they are brands that a lot of Dylan's Candy Bar customers shop, and I myself like a kitschy and cool product. When we pitched the idea to be one of the WRAPT brands, we thought it was a great way to reach customers we weren't getting on the east side in the 60's [flagship location]. And JCPenney has so many stores that it's a great reach for us. Me: Where else can a shopper find Dylan's Candy Bar? DL: Our flagship is in New York City, and we've been in hotels like the W and Four Seasons, and stores like Macy's, Lord & Taylor, Bloomingdale's. We have stores in other cities like Orlando, Houston, East Hampton, and we're opening Miami and L.A. soon so that'll be exciting. Still, this is a different demographic that's good to reach, and everyone loves candy. Me: What's your favorite product? DL: Everything! I think what's exciting is we have a lifestyle brand, it's not just candy, so we have things like stationery and smelly jellies, which are all these different colored pens that smell like candy. I love this stuff, it makes the workday more fun when you have a cupcake notepad! So I think the non-edible is just as fun as the edible. And there's a lot of color and color makes people happy, and we pay a lot of attention to our packaging. [Dylan points out some cupcake items] There's colorful cupcake cookies, that's for a younger customer, whereas the cupcake truffles make a nice hostess gift, so there's really something for everyone. Here I interject a random comment about moms having fun opening candy with kids. DL: Totally! But also, this is one of my favorites [shows me a boxed gift set]: this is our three-tiered tower box, right now it's exclusive to JCPenney because it's a mini-version, but I like to use these boxes when I'm done with the food that's in it for jewelry and crafty stuff. Me: Adorable! Thanks so much for your time! I dropped by JCPenney in Manhattan Mall today and am happy to tell you that several of the brands featured at WRAPT, like The Smile Shop, Maxim, and X-Treme Geek, are buy one get one 50% off. Um, hello holiday bargain! Me, I'm seriously considering the MoMA Design Store owl kitchen timers for all five of my sisters, along with plenty of Dylan's Candy Bar stocking stuffers.